Prior to the American Civil War, two gentlemen named Sharp & Hamilton operated a southern farming implement company under the trade name Nashville Plow Works. As the war loomed, the owners converted their establishment into an armory, and the Nashville Plow Works continued making weaponry for the Confederate states until April 1, 1862, when Nashville was taken by Federal troops. 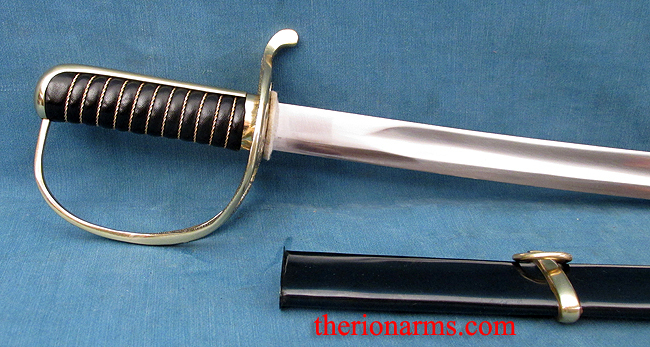 This reproduction saber has a 1060 high carbon steel blade tempered to an excellent flex, and, as with the historical weapons, the pommel and back strap are of one piece.The brass guard features "CSA" and "Nashville Plow Works" cast in block letters on the underside. The matching scabbard is blackened steel with brass fittings.